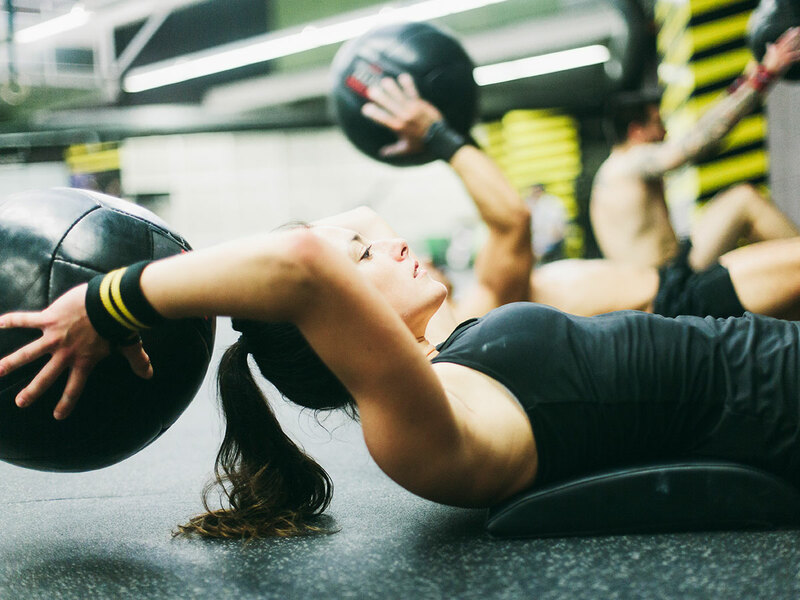 While the PhysXtreme Ottawa boot camp may leave you a sweaty, dirty mess, you’ll find our high-performance training facility to be kept impeccably. The facility itself is jaw-dropping. We have tons of classes to choose from, our coaches are at the top of the charts, and our community is the best in the region, but you’d only believe me if you experienced it for yourself! The PhysXtreme Bootcamp is a serious strength and conditioning program that delivers the best results possible for the least time investment. If you can ONLY make it the gym 2-3 times per week, you will see the best improvements in strength and conditioning with Bootcamp. Because CrossFit is highly dependent on skill acquisition, and skill acquisition takes frequent practice, developing proficiency in CrossFit tends to be easier in those who train 4+ times per week. The PhysXtreme Bootcamp does not use exercises that require a high level of skill such as Olympic weightlifting and their variations, as well as the more advanced gymnastics movements. This means you get to come in and push harder right from day one. This translates into improvements in strength and conditioning in less time. These training sessions are designed for people who can’t necessarily commit to training sessions four or more times per week, but still want to get all the same benefits as CrossFit. Because CrossFit makes heavy use of Olympic weightlifting movements, it requires frequent practice to see improvements. Bootcamp allows those who are only able to train two to three times per week to see better improvements than they would doing CrossFit two to three times per week. The PhysXtreme Bootcamp in Ottawa and Gatineau uses barbell strength training as its foundation. It also uses an equally wide variety of training tools, allowing for endless variety in programming, which keeps the training fun. And if it’s fun, you want to do it, and if you do it… you get results! Due to the excellent scalability of our programs, you will be doing the same workouts as everyone else regardless of where your fitness level is at the beginning. We will give you suitable regressions and progressions as needed to accommodate your fitness level. You do not have to be as strong, fast, or fit as everyone else, but you must give a 100% best effort, 100% of the time. We know joining a gym that specializes in Bootcamp can be a little intimidating. You might start thinking “Can I actually do this?” Then there’s the fact that these gyms usually cost more than a regular gym. To take the fear out of the equation, PhysXtreme Bootcamp in Ottawa and Gatineau offers a 4-week bootcamp test drive program. You’ll start out on your 4-week test-drive by taking our three bootcamp fundamentals classes which will prepare you to safely enter the regular bootcamp classes and give you plenty of time to try an unlimited number of bootcamp classes before you need to commit to a membership. Of course with a 6:1 athlete:coach ratio you know you’ll be well prepared for the regular classes, and knowing you have an educated and experienced coach with you at every single regular class afterwards, you’ll notice a big difference in the amount of progress you make at which point the higher cost of such a program starts to make sense. With classes as low as $6/ with an unlimited membership, you’ll wonder why you didn’t start bootcamp a long time ago! Already have experience with Bootcamp? Still haven’t found a gym that you love going to, and a workout program that truly delivers the results you’re paying for? Well, your search is over! And if you’re a little skeptical, who could fault you for that? Far too many promises, and far too little follow through are common in the fitness industry. But we’re going to prove to you that we’ve got exactly what you’re looking for. We’ve got an awesome 4-week unlimited access bootcamp test-drive for you just so there’s no doubt in your mind. Our 4-week test-drive will give you everything you need to really know before making any long-term membership commitments. You’ll get a real feel for our high-end programs, coaches, facility, and especially our outstanding community here at PhysXtreme. You’ll start out by taking our three bootcamp fundamentals classes. You’ll learn the foundational movements that you’ll see on a regular basis in the bootcamp program. You’ll learn how to squat, deadlift, flip tires, swing a kettlebell and use a sledgehammer, as well as improve your mobility so you can do it all safely and effectively. Once you’ve completed the fundamentals classes, you’ll join the regular ottawa boot camp classes and have unlimited access until your 4-week test drive. Many people want to try out a free class, but it’s possible that a single workout may not be enough to help you make the right decision. So we’ll get you started before making any long-term membership commitments with a four-week trial beginning with three bootcamp fundamentals classes just so there’s no doubt in your mind. You’ll follow up the three ottawa boot camp fundamentals classes with an unlimited number of regular classes. In addition, by first taking our three fundamentals classes first, you’ll be much more prepared and will get so much more out of the training programs once you join our regular Bootcamp classes. We feel this is the best way for you to really feel and see the results you can achieve with our programs, coaches, facility, and most of all community and support system. To get started, click the link below. Once you’ve completed your purchase, you’ll receive an email from us with further instructions on how to book your fundamentals classes. At any time if you’re having difficulty with the process, please don’t hesitate to reach out to us. We’re happy to help!